Practice single-digit subtraction facts through multi-digit subtraction word problems with these subtraction worksheets. Don't see a printable you need? Use our Test Maker™ to create printables that fits your needs. Browse subtraction questions or use our advanced search to find existing questions while filtering by grade levels and keywords. 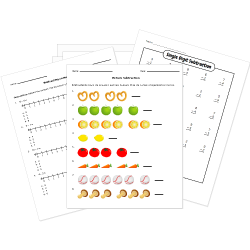 Quickly create free printable worksheets for drilling and practice with our Subtraction Worksheet Generator. Subtracting on a Ruler - Word Problems new!